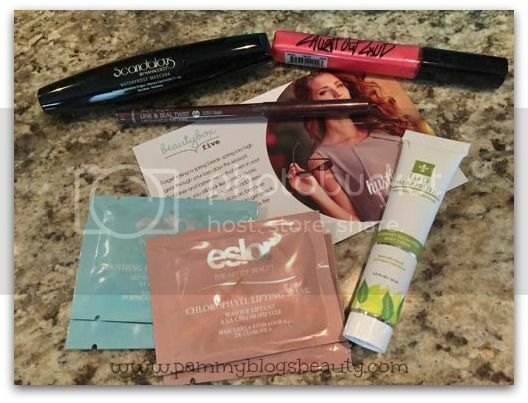 Pammy Blogs Beauty: Beauty Box Five: March Box Opening! Beauty Box Five: March Box Opening! Beauty Box 5 is a monthly subscription service that delivers 5 cosmetic samples to your door for $12 a month. The samples are all deluxe and sometimes the boxes include full-sized products, too! Shipping is free on every box. :) When you subscribe to Beauty Box 5, each month you get a beauty box delivered right to your door! The boxes contain a mix of makeup, beauty accessories, skincare, fragrance, bath& body items, and nail products. 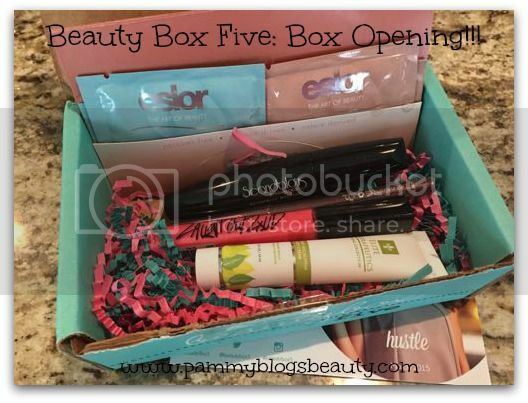 Beauty Box 5 is a great way to discover new products or get yourself out of a cosmetics rut! Interested in hearing about what I got in this month's box? Click "read more" below to find out what is inside the March Beauty Box Five Box! Styli-Style | Line & Seal Twist Mechanical Eye Liner (Full size! Retails for $4.99): Yay for an eyeliner from Styli-Style! I have not used this brand in ages, but if I remember correctly, I get incredible long wear from these liners. I got the shade "rasin" which is a lovely brown. I can't wait to wear this! These creamy, pigmented pencils go on super smooth to give a perfect line or wing and their fun twist-up design means you never need to use a sharpener! Laugh Out Lout by Nanacoco | Lip Gloss (Full size! Retails for $3.99): Oh yay!!! A lipgloss! This is a totally gorgeous fruity scented coral lipgloss! This shade is absolutely perfect for Spring/Summer! I am super excited to wear this! :) So, two samples from Nanacoco this month. I am really going to get to know this (new???) brand! Warning: the gloss addicition starts now. Pretty pigments, seriously sweet smell factor, and non-sticky formula all make this our latest product crush. Beauty Box Fivers-What do you think of your box this month? I am loving all of the makeup samples for sure! Lots of full-size products, too! This was a great month for BB5!